HBI-USA, a biomedical device company, announced today its new SnorePro which uses its proprietary Dynamic Snore Detection (DSD) technology to precisely detect snores and to gently issue a programmable digital pulse to prevent snoring. The digital pulse functions like a spouse by nudging their snoring bedmate, which in turn trains the body to change sleep positions to eliminate the snoring. Bedmates of snorers lose an average of one hour of sleep per night due to snoring. HBI-USA, a biomedical device company, announced today its new SnorePro which uses its proprietary Dynamic Snore Detection (DSD) technology to precisely detect snores and to gently issue a programmable digital pulse to prevent snoring. The digital pulse functions like a spouse by nudging their snoring bedmate, which in turn trains the body to change sleep positions to eliminate the snoring. Bedmates of snorers lose an average of one hour of sleep per night due to snoring. The stimulation may disturb the snorer; however, it helps their bedmates to enjoy and regain sleep as they won’t have to nudge the snorer any more. The SnorePro is a wrist-worn, watch-like unit. The built-in LCD screen displays snore history and allows users to track their improvements over time. It can also help identify and address external factors such as sleep position or consumption of alcohol/cigarettes, which are often responsible for increased snoring. 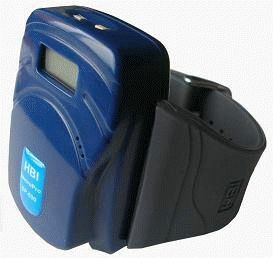 The SnorePro offers many superior features that are not available on the market today, such as an adjustable threshold (the snore intensity is measured in dB and filtered against any prevalent background noise before triggering a pulse) to adapt to the sleeper’s noisy environment and a 3-2-1 Training Program that enable users to reach the best results. Beginner: At this step only three continuous snores can activate the pulse and there is no action against a single or two continuous snores which allow users to learn and adapt to the biofeedback training process. When the snore history shows improvement, users are ready for the next level. Intermediate: Just two continuous snores will activate the stimulation. Advanced: It acts on a single snore. This mode may be too severe and disturbing for a beginner. However, to achieve best results, users should move from beginner, intermediate, and finally to the advanced mode. · Snoring is due to poor muscle tone in the tongue and throat, excessively bulky throat tissue, and obstructed airways to the nose or nasal septum. · Approximately 80-million people are affected by snoring in North America. More than one-third of those snorers are men. · Snoring leads to lack of restful sleep and can cause serious health issues such as sleep apnea, high blood pressure, heart attacks and even car accidents. Snorers are three-times more likely to be involved in a car accident than non-snorers. The MSRP of this watch-like unit is $119.99. However, during the initial three-month launch period it sells for a special price of $99.99.